Michael Smith Engineers presents the SLR pump, a positive displacement sanitary construction rotary lobe pump suitable for use in the dairy, food processing, beverage, cosmetic, pharmaceutical and fine chemical industries. Designed for maximum efficiency and reliability the SLR pump incorporates two lobe rotors which rotate synchronously inside a casing without contact. As the rotors turn, the spaces between the lobes and the casing are filled with the product, and a fixed volume is displaced with each rotation. The pump generates a continuous smooth flow thanks to the tolerances between the lobes and the pump casing. This enables efficient, low shear pumping, even for delicate or viscous liquids and those containing solids. 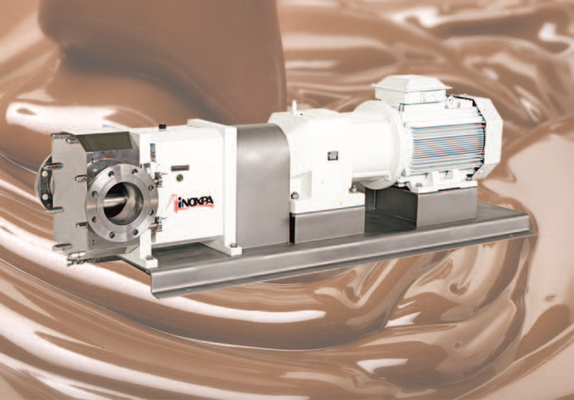 SLR pumps feature an RA surface finish of < or = to 0.8µm, a bright polished external finish and gaskets / seals to FDA standards to ensure no contamination to food products or other sensitive ingredients. CIP (clean-in-place) or SIP (steam-in-place) at temperatures up to 140ºC can be used as quick, easy and safe methods of cleaning the pump without disassembly. The pump is also reversible (when operated without a relief valve) allowing for unload / offload duties to be performed with the same pump. Units are supplied as standard with hygienic DIN 11851 connections, although other options including RJT, SMS and tri-clamp are available to provide optimum flexibility for specific onsite requirements.